Key Difference: Acute myeloid leukemia (AML) is a cancer that affects the myeloid line of blood cells. Acute lymphoblastic leukemia (ALL) is a cancer that affects the white blood cells by producing excessive lymphoblasts. AML occurs when a myeoblast goes through genetic changes and freezes in the immature stage. ALL occurs when malignant, immature lymphoblasts multiply in the bone marrow and hinder the production of other normal blood cells. Acute myeloid leukemia (AML) and Acute lymphoblastic leukemia (ALL) are two of the eight different kinds of leukemia that exist. Leukemia or leukaemia is a type of cancer that targets the blood or the bone marrow. Leukemia is a broad term referring to a cancer of the blood and bone marrow, which is further classified under hematological neoplasms, which is an umbrella term referring to diseases affecting the blood, bone marrow, and lymphoid system. Leukemia is a curable disease, but depends on the type of disease, the age of the patient when diagnosed and the progression of disease when diagnosed. Acute myeloid leukemia (AML) is a cancer that affects the myeloid line of blood cells. The malignant cell in AML is known as a myeloblast; however, a myeoblast that is not malignant is basically an immature precursor of myeloid white blood cells. A non-malignant myeoblast will develop into a mature white blood cell. AML occurs when a myeoblast goes through genetic changes and freezes in the immature stage. A single myeoblast will not develop into cancer; however, when a frozen myeoblast combines with other mutations, it can develop into leukemia. IN AML, the cells cause rapid growth of these immature white blood cells in the bone marrow disrupting the production of normal blood cells. AML occurs more commonly in adults and more in men compared to women. The incidences of AML are believed to increase with age. 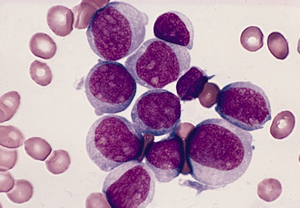 AML is caused by the replacement of normal bone marrow with leukemic cells, which causes a drop in red blood cells, platelets, and normal white blood cells. Symptoms of AML include: fatigue, shortness of breath, easy bruising and bleeding, frequent occurrence of infections, etc. There are many variations of AML, which are caused by differences in cytogenetics, the structure of the leukemic cell. Some subtypes of this disease have a good prognosis, while others have a bad one. Complete eradication of the cancer is considered best when leukemia is diagnosed in the early stages. Treatment includes chemotherapy and a combination of other therapies that keep the patient from going into remission. Acute lymphoblastic leukemia (ALL) is a cancer that affects the white blood cells by producing excessive lymphoblasts. Lymphoblasts are immature cells that develop into lymphocytes, a type of white blood cell that is an important part in the central immune system. These malignant, immature white blood cells multiply in the bone marrow and hinder the production of other normal blood cells. These cells crowd out normal cells in the bone marrow. AML is specially dangerous as it spreads to other organs, but it does not form tumors, making it difficult to catch. AML is more common among children and senior adults. It is found commonly during the ages of 2-5 in children and shows another peak in old age. The term ‘acute’ is assigned to describe the short time course of the disease because if left untreated, the disease can cause death in a short number of months. ALL is caused by the spreading of these malignant immature white blood cells throughout the whole body, specially spleen, lungs and lymph nodes. Diagnosis is usually done through medical history, physical examination and complete blood count. The blood count shows if there is a high level of lymphoblasts or a low level of red blood cells in the system. There are many variations of ALL, also caused by the differences in cytogenetics of the cell. The Cytogenetic translocation determines the prognosis of the disease and whether it is curable. Symptoms of ALL include: weakness or fatigue, anemia, unexplained fever, weigh loss, excessive bruising or bleeding, breathlessness, enlarged spleen, liver or lymph nodes, bone/joint pain, etc. Rapid growth of white blood cells that accumulate in the bone marrow and hinder production of normal blood cells. Malignant, immature white blood cells multiply rapidly in the bone marrow. Replacement of normal bone marrow with leukemic cells, which causes a drop in red blood cells, platelets, and normal white blood cells. Damage and death by crowding out normal cells in the bone marrow, and by spreading (infiltrating) to other organs. Preleukemia, Chemical exposure, radiation and genetics. Acute myeloid leukemia with recurrent genetic abnormalities, AML with multilineage dysplasia, AML and MDS, therapy-related and AML not otherwise categorized. The French-American-British (FAB) classification system divides AML into eight subtypes from M0-M7. The prognosis depends on a number of factors such as: Cytogenetics, Myelodysplastic syndrome, age, lactate dehydrogenase levels, genotype. Higher survival rate (about 20-75%) because of new chemotherapeutic agents and improvements in stem cell transplantation (SCT) technology. Prognosis depends on: gender, ethnicity, age, white blood cell count, cytogenetics, spread of cancer, morphological, patient’s response and genetic disorders. Certain cytogenetic abnormalities show very good outcome, while a few abnormalities offer poor prognosis and a higher relapse rate. Abnormalities t(8;21), t(15;17), inv(16) have a good prognosis, while -5, -7, del(5q), Abnormal 3q, Complex cytogenetics has a bad one. Cytogenetic change which offers good prognosis includes: High hyperdiploidy (specifically, trisomy 4, 10, 17) and del(9p). translocation between chromosomes 9 and 22, t(4;11)(q21;q23), t(8;14)(q24.1;q32), Complex karyotype and Low hypodiploidy or near triploidy offer poor prognosis. A myeloblast is the immature cell that develops into myeloid white blood cells. In AML, a single myeloblast goes through genetic changes that results in it freezing in the immature stage. AML happens due to "differentiation arrest” combining with other mutations and disrupts normal production. The body starts producing many immature cells, resulting in AML. Abnormal blood count, high levels of white blood cells, leukemia blasts, low red or white blood cells, peripheral blood smear, bone marrow aspiration and biopsy. Medical history, physical examination, complete blood count, blood smears. High levels of blood count give worse prognosis. 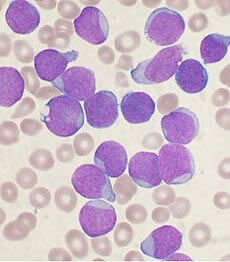 Leukemia blasts seen on blood smear. Bone marrow biopsy as well as lumbar puncture can be used. Chemotherapy is divided into two phases: induction and postremission therapy. Others include, Targeted therapy Radiation therapy and bone marrow transplant. Chemotherapy, steroids, radiation therapy, intensive combined treatments (including bone marrow or stem cell transplants), and growth factors. Biological therapy and Immunotherapy also used. Leukemia treatment depends on type of leukemia. Acute leukemias normally require prompt, aggressive treatment, despite significant risks of pregnancy loss and birth defects. It is possible for leukemia to spread from mother to child. Please correct the table as its contents are mixed up and creates lot of confusion. Whats the difference between acute myeloid leukaemia and acute myeloblastic leukaemia? Please explain!